Squee! I adored Love in the Time of Cholera even more than 100 years. 🙂 The only Marquez I haven’t loved is The Autumn of the Patriarch (which I instead hated…so at least there was still passion, lol). I’ve still got about half of his stuff waiting for me, and I love knowing there’s more to explore! I loved this book as well! I agree that it was very different from One Hundred Years of Solitude, but in a way, it impressed me that he could be versatile, yet so brilliant in both books. I also agree that he doesn’t sugar coat the romance in this book and because of that it seems more real, and like the love that many of us experience. I actually saw that movie version of this book a few years ago, and while I thought it was good, it in no way lived up to the book. Which of his books do you think will be your next read? I have heard some positive things about Memories of My Melancholy Whores. First, I’m going to say that I really, really hope that I’ll like 100 Years of Solitude when I need to read it in a few months for my book club. Second, if I do, I wonder if I should try this one again. I gave up halfway through, just couldn’t take any more of it. But maybe, if I love and understand his prose from a different book first, I will understand this one better? I’ve always preferred Love in the Time of Cholera to 100 Years of Solitude, but that’s shaving with a pretty sharp razor. I will say that my other forays into the Marquez corpus have been disappointing…The General in His Labyrinth and Memoirs of My Melancholy Whores didn’t scratch the Marquez itch I had. I read this last year and just adored it. It may in fact be my favorite book club read ever. One of these days I’ll get to more Marquez books. 100 Years of Solitude has been on my list a good 20 years at least! @ Eva: I remember that you HATED The Autumn of the Patriarch, which I thought was sad, since it’s always such a huge disappointment when a beloved author so completely misses the mark! And I too am looking forward to reading more Marquez… but perhaps not Autumn! @ zibilee: I was curious about the film version of this one, but remember it got pretty universally panned when it came out. I just don’t see Marquez’s books translating all that well to the screen as at least 50% of their brilliance is the writing. Not entirely sure which book of his I might read next… I have The General in his Labyrinth so that might be the next obvious choice, but the two that I’ve read were the two I always wanted to read, so I guess we’ll see what strikes my fancy when my next Marquez craving strikes! @ Amanda: I did see you had this on your abandoned shelf on GoodReads… I know there are some people out there who just don’t care for Marquez, though of course I feel the opposite! I’m not sure how you’ll feel about 100 Years, because I’m not sure what you didn’t care for in this one. I did prefer 100 Years, as do many people I know, but as you can see, others feel the reverse. I do hope your next meeting with Marquez is better! @ Skip: I think for me, 100 Years just felt like a perfect novel but it was also my first exposure to Marquez. Perhaps the tables would turn if I had read this one first… Sorry to hear that you didn’t like the other Marquez you’ve read nearly as much. It makes me nervous! @ Teresa: I remember you reading and loving this one; it made me so happy to read your first flirtation with Marquez went so well! And it must have made for such a vibrant book club discussion. I really hope you’ll get to read 100 Years soon! Hi! I’m new to your blog and love your reviews. When I saw you had a Marquez review I went crazy. He is one of my favorite authors. Like others, I prefer Love in the Time of Cholera to 1000 years. Due to your review, I just started reading Disgrace by Coetzee. I’m digging it so far. Thanks for your insightful writing! 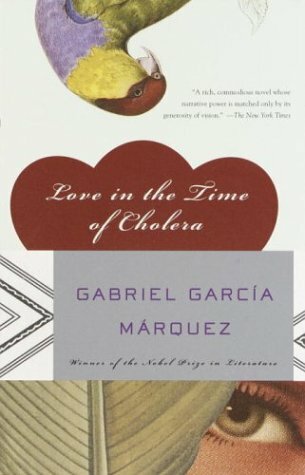 I still haven’t read any Gabriel Garcia Marquez, but I own this book and have nearly picked it up a few times. Your review makes me want to run upstairs and grab a copy…if only I didn’t have that pile of Bookers to get through 🙂 I’ll try to read it in September. I’m 0 for 2 with 100 Years of Solitude. I still want to read Garcia Marquez, though…maybe I should give this one a chance. @ Shantel: Thanks so much for stopping by and commenting! Marquez is definitely one of my favorite authors, too, and it’s great to hear from a fellow fan. I can’t wait to hear your thoughts on Disgrace! @ mee: So glad to hear you are enjoying 100 Years… If you love it wholeheartedly in the end, then I definitely think you should try Love in the Time of Cholera next! @ Jackie: Hopefully once you make it through the Booker you will get the chance to try some Marquez… I’d love to see what you think of him, because the writing is great and I think plenty of stuff happens, but I wonder if the contemplative nature of his novels would be a bit of a turn off for you. I guess we’ll see! @ softdrink: Sad to hear you haven’t had much luck with Marquez thus far; I think 100 Years is one of those books you either love or hate – it either grabs you at the very beginning and refuses to loosen its grip on you, or you’re bored. For me it was obviously the former, but I know not everyone feels the same… Certainly there are those who prefer this novel though, so maybe you should give it a try and see whether it works better for you. @ Nymeth: I get anxious too when I see reviews of books/authors I love, but I am certainly on Team Love when it comes to Marquez! Yay! I’m not the biggest García Márquez fan in the world (unwieldy clarification: I like him and agree that he’s a wonderful writer at times, but I prefer tons of other novelists to him not being a magical realism fan for the most part), Steph, but I loved seeing your enthusiasm for him here. Kind of inspiring actually! If you’re in the mood for another García Márquez fix but aren’t yet ready for a novel, you should think about checking out some of his short stories or non-fiction pieces, many of which are also rather nice. Have you read any of those? Cheers! Definitely a gaping hole in my reading history, which I must rectify sometime. Your review is very interesting and its good that you were able to highlight the areas you weren’t quite so pleased with. I rather like your wordpress template with the paperclips. I’m using Atahualpa a the moment. @ Richard: I really adore magical realism, so I think that’s why Marquez is such a good fit for me. I do have a collection of his short stories that I will probably read at some point (I really need to be better about including short fiction in my reading), and I look forward to seeing how he tackles that literary form. I hadn’t considered reading his non-fiction, but now that you mention it, it is probably something I’d find really rewarding and should explore as well. There’s also a recent biography about him that’s been released that I’d like to try at some point! So I have tons of Marquez on the horizon it would seem! @ Tom C: I’d love to hear your thoughts on Marquez should you eventually read him! He’s such a strong writer that any bits that are less than perfect are really just me being nitpicky! I like your point about his prosaic approach to love. I liked the book as well (though I think not as much as you seem to have). His writing is beautiful, poetic. I was a bit turned off though with his relationship with his god-daughter. I also remember another love affair he had with a married woman where she was killed by her husband when he discovered the affair. I must be the only one that hated this book. It took all I had to finish it! @ Nishita: I was also put off by the relationship with the god-daughter, and I agree that in a way, it was frustrating that Florentino never seemed to really suffer from his selfish choices but others did instead. There was an element to his romance with Fermina that I appreciated, but I certainly did think there were creepy/unsavoury elements to their grand romance as well. @ Stephanie: No, you weren’t the only one who didn’t love this one! While I really enjoyed it, many others have chimed in saying they didn’t much care for it. Such is the wonder of the book blogging world!